Successfully Added Universal AC/DC Smart Laptop Multi-Voltage Power Supply to your Shopping Cart. 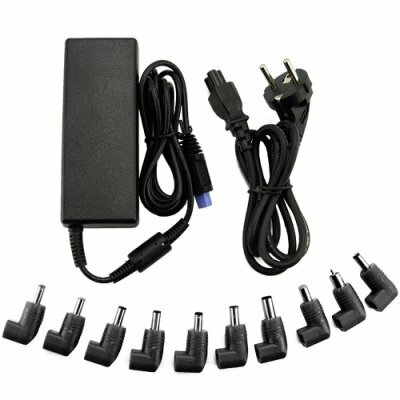 Universal AC/DC smart laptop power adapter with ten connectors for powering most major brands of notebook computers. This multi-voltage universal AC/DC smart laptop power adapter is designed for today's popular notebook computers which require input from 12V-24V and output power up to 100W. As a universal device, the adapter works with laptops and notebooks that operate across a range of power requirements. This unit is not just a simple "power brick" replacement - this versatile adapter has built-in safety features including overload and short circuit protection along with automatic thermal, overcurrent and overvoltage cutoff. If you need to replace the power brick for your notebook computer, then you will find this unit will do the job just fine while costing 75% less than an OEM model. It is in stock now and available for single piece or bulk orders. Universal AC/DC smart laptop power adapter. The ten power tips supplied will cover the vast majority of modern laptops on the market but for peace of mind a compatibility guide is included in the box. I got one as a sample, then my friend took it from and was willing to pay double the price.Hmm, i tought that was cool because already i know i could order another one from chinavasion.I did and now i have two extra incase someone comes by and willing to do the same, i could still be left with one atleast because my fear is that sometimes it could go out of stock and i could be stocked without any of my own. Prudent. This is cool, i recommed it to everyone who knows what safety laptop adaptor means. based on the pictures the oulet plug is matching only the europen market not north american market. do you have in stock Ac adapters for North america use. by the way can you send me the contact of the sales agent that I could contact him. I am definately buying this! !